For Mohd. Rafi, ghazal singing must have come naturally. Having come from an Urdu background, he must have been influenced early in life with Urdu couplets and Ghazals, just like any other boy of his background. Hindi film music has produced many great Ghazal exponents and Mohd. Rafi is one of these greats. His added gift of clarity in voice, pronunciation and diction went a long way in presenting to the Hindi film music many a great ghazal composition. Some of the very best that come instantly to mind are (1) Mujhe Dard-e-dil ka pata na tha, mujhe aap kisliye mil gaye, (2) Na kisi ki aankh ka noor hun, na kisike dil ka karar hun, (3) Lagta Nahir Hai dil mera ujade dayar mein (4) Tujhe Kya Sunaun Mein Dilruba Tere Saamne Mera Haal hai, (5) Zara Sun Hasina-e-naznin Mera Dil Tujhi Pe Nissar hai (6) Bhari Duniya Mein Aakhir dil ko samjhane kahan jayen, (7) Gujre Hain aaj ishq mein hum is makam se, (8) Naseeb Mein Jiske jo Likha Tha (9) Zindagi Aaj mere naam se sharmati hai, (10) Door Rah Kar Na Karo Baat Karib Aa jao. There are many more which readers may like to point out. From the film GHAZAL, the evergreen â€“ Rang Aur Noor Ki Baraat Kise Pesh Karun â€“ is one Ghazal for all seasons. The song was not only popular in the 60s but is hummed by all Ghazal lovers and Urdu poetry followers even to this day. Other two variations of the same Ghazal one each by Rafi himself and by Lata Mangeshkar from the same film â€“ Ishq Ki Garmiyen Zajbaat Kise Pesh Karun and Nagma our Sher Ki Saugat Kise Pesh Karun were also equally well rendered. But the soul of that film and indeed of that era was the first song from this film. Mohd. Rafi sang many duets which are Ghazals and with all female singers alike. Notable among them were with Lata Mangeshkar, Asha Bhonsle and Suman Kalyanpur. While he never tried to dominate, his superior singing always put him ahead of his female singers. Not that these three ladies did not justify themselves, they did splendidly. But they were left a notch too short when compared to Mohd. Rafi. Dile-e-betab ko seene se lagana hoga , Mijaze Garami Duwa hai aapki, Humsafar Saath Apna Chhod Chale are all examples of the highest standards of Ghazal singing by Rafi and the female singers mentioned above. I sometimes wonder whether there will be music of any kind left in the Hindi film world after a few years. The way things are going â€“ all noise and no sense of lyrics or compositions â€“ leave alone any sensible singing â€“ the doomsday is not further than a few years for the Hindi film music. The film industry must think about it seriously. They lyricists should write beautiful and meaningful poetry. The Music directors should revive the old magic of the yesteryears and the singers, for whatever they are worth, should learn from the great masters who have left behind them troves of treasurers in the form of tens of thousands of the best of music. Music companies would reap rich dividends if they compile the various moods of Mohd. Rafi life Bhajans, Romantic Songs, Sad songs, Ghazals, Patriotic songs, Qawwalis, etc. and release fresh volumes in each style.. These would sell like hot cakes and would also benefit millions of new generation music lovers who are desperately seeking to enjoy music where there is none these days. 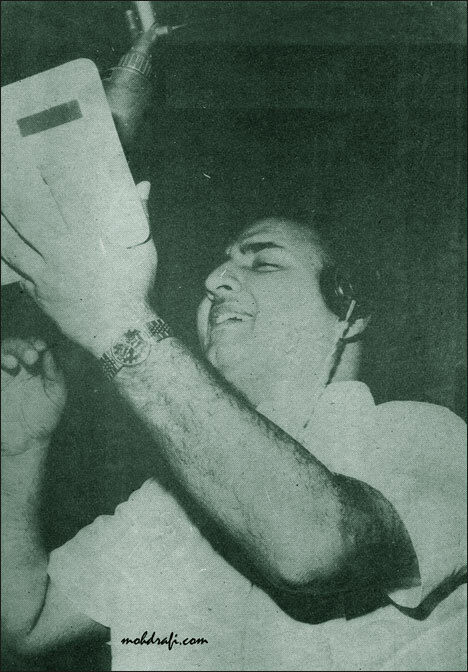 Other notable Ghazals from the Rafi stable include â€“ Tum Ek Baar Muhobbat Ka Intehan Toh Lo, Kal Raat Zindagi Se Mulaqat ho Gayi, Maana mere Hasin Sanam Tu Rashke Maahtab hai, Koi Nazarana Lekar Aaya Hun Main Diwana Tere Liye, etc. The list is certainly endless and I could add many more to it. But I would like Rafians out there to respond and interact by sending their comments and complete the list of Ghazals sung by the greatest singer of all times – MOHD RAFI. This entry was posted on Saturday, May 26th, 2007 at 8:45 pm	and is filed under Meri Awaaz Suno. You can follow any responses to this entry through the RSS 2.0 feed. You can skip to the end and leave a response. Pinging is currently not allowed. Only true lover of Rafi saab can write like above. Is duniya main Rafi saab jaisa na koi hua hai or naa hi kabhi hoga. For music lovers like you and me, Rafi saab is God. Excellent article and wonderful collection of songs of gods own voice – md rafi. ! Remembering – unke khayal aaye toh aate chale gaye , ye zulf agar khul ke bikhar jaye toh achha ! ..beautiful list of songs ! Mohammed Rafi Sahab Ki Awaaz Ko Kabhi Nahi Bhul Payenga…. Agar Unke Gane Ki Awaaz Kaha Pai Bhi Suni Tho Vo Gane K Sath Har Koi Gun Gunayenge. Mohammad Rafi Saheb ki awaaz ko na hum bholayenge na bhola payenge. Bas inke tarane duniyan me gun gunayenge. Een zanger als mohammad rafi zal nooit meer komen Allah heeft hem gekozen als zanger de enige echte MOHAMMAD RAFI SAHEB, Ik ben zelf een grote fan van chach saheb. Met alle respect aan andere zangers van india wat mohammad rafi kon presteren met zijn diamanten stem kon een ander niet na bootsen,het is mohammad rafi gegeven door Allah een goed hartige mens leeft en laat andere ook leven. ALLAH BLASS MOAHAMMAD RAFI SAHEB. (ASHRAFIE) J.J.M.K. I am amazed at the comments that have been appearing at the end of my article written with a specific purpose to sing praise where praise is required. I agree that I neither have full knowledge of all the thousands of ghazals that Rafi sahab had rendered and also that I may have forgotten to add many more that are known to me. Suffice it to say, all I had intended was to write on a topic called ghazals from hindi films which were sung by rafi sahab. Sure many great comments have also followed my article and many more have given valuable inputs too. However, of the 82 comments so far received on this article, I find it very disheartening that almost half of them are not exactly comments on my article or the subject on which I had wanted rafians to react, but sadly and disgustingly they were nothing less than “war of words”. While sending a comment, the readers should stick to the theme of the article and may praise or criticize the author. But straying on to different paths and almost mudslinging one another makes no sense to me at all. I too go through all the articles that are published on the website every day and sometimes I do give my thoughts. But let us be sensible enough not to indulge in such petty squabbles as to make first timers visiting this website make it their last. We all like good music and we have the highest regards of the singers of the past, Kishore Kumar, Mukesh, Manna De, Mahendra Kapoor, K.L. Saigal and all the others from the distaff side. But still this is not the site for us to shower them with praises. There are several other websites which are devoted to musicians, singers and people from the glamour world and those who find the grass is greener elsewhere, let them stick to their fences. Why indulge in uncalled for diatribe with true rafi lovers ?? This website could more than just “moderation” before a comment is posted. It could delete a deregotary comment, if need be. That would filter most of the dirt-war that is unnecessarily generated. Think about it, Sir. descried article. Your job is praisworthy. Thank you very much Sawant Saab for the beautiful article on “GAZAL”. I feel we are using the word GAZAL very loosely and simply call every alternate song a GAZAL. A basic question. Can any body explain me what is actually a GAZAL? some time and read responses to the article : Rafi vs. Kishore. I wonder what this name “BINUS2000” is and what this name “PEARL” is ! come out with their real names ? kinaron me kya rakha hai ! isharon me kya rakha hai !! can be seen between Rafians and KK fans. Rafi Sabb’s talent and Godgifted ability. so friends, ignore few lunatics and enjoy the heavenly melodies of Rafi Saab. debjyotis kkkalansand abhishek -all are rafi fans.they clearly know that some bad comments agaist rafi will surely ignite a detailed talk about rafi and his greatness.they are surely getting satisfaction from the subsequent discussions.some people are like this.they never say any thing straight. You ask me whether I am a musically literate…. on this, I give my views…. We have only one birth to live and let us enjoy by listening to the greatest singing legend Rafi Sahab whose voice has mesemerised millions of music lovers across the world. Congrats for a qualitative article and no singer can match Rafi Sahab in quality n quantity Ghazal singing in films. Sadakchhap aur musically illiterates ? Are you musically literate ? let me know about your musical knowledge. and bashing. If you can show me will do this there too. Hope, you will change your attitude and learn some manner. Rafi Sahab was a king among Singers, I don,t think somebody could be able to sing like him. He delivered thousands of songs with accurate imotions for every mood. Many many thanks to all those who shared collection of pictures and videos of Rafi sahab with others. If we are talking about the filmi ghazals its ok, but if it is in general how we forget the ghazals which is composed by Mohd Rafi. u cant help yourself from listening to ghazals sung by the greatest singer ever late mohd rafi saab.They include; ghazab kiya tere vade pe aitabar kiya; yeh na thi hamari kismat; na shoke vasl ka dava hai na; kado gaqsu me shoke;unke khayal aye toh ate chale gaye; ek hi baat zamane ki kitabo me nahi; mene socha tha;teri to chand sitaron mein baat hoti hai; talkhiye main me zara talkhiye dil bhi ghole; to name a few. And as far as greatness is concern no need to say about him, for he outshines every personality in bollywood in both ways viz.talent and as a great human being.His simple yet complex style caused envy among his contemporaries including nightangle lata. Above all he is the greatest model of our secularism with bhazans of great repute. the other is the most melodious of all. what a pair !!! jane kahan gaye wo din ??? Music of ‘Hum Dono’ was composed by Jaidev assistant to S D Burman. The fact is that Amitabh became Amitabh on his own; forget music, he didn’t even need heroines. All the songs that have been listed in post no. 61 were sung much after Amitabh became a superstar. Anyway, none of the five songs listed qualifies as a ghazal, unless I am mistaken. In the article and the associated posts, Rafians have listed ghazals like Tujhe kya sunawoon main dilruba, Lagta nahin hai dilruba, Tumhari zulf ke saayen mein, Guzre hain aaj ishq mein, Koi sagar dil ko bahalata nahin, Kabhi khud pe kabhi halat pe, Hum bekhudi mein tum ko pukare chale gaye… and what kind of songs are being offered as comparison? Pag ghungroo bandh ke meera nache re. Rafians, let me warn you that there will soon come a day when they will say that this song is better than Madhuban mein radhika nache re. What is “de de pyar de”? I haven’t heard it; can someone tell me if it’s a ghazal, thumri or folk tune? Someone on the other forum stated that the song “Khaike paan banaraswalla” is the best folk song ever! Has the world gone crazy? A film is whole teamwork,actor,director,M.director,singer,lyrics,etc.etc. Neither individual can make any thing one handedly,its a team work. But if one can analyisis and see whole filmy singers and hindi songs than it is naked truth that only Rafiji is versatile singers who had sings masti bhare geet,bhajans,qwallis,dard bhare nagme,gazals,with eual eas. Rafi sang many songs for amitabh before and after his stardom.A song from dostana – Mere dost e kissa kya hogaya is to be listen,to see that how he renderd perticular song that you can not image Kishoreda can able to sing with that depth. For rajesh khanna lastly he sang for mehbbob ki mahendi. Honestly answering…kishor was a popular singer when amitabh was just struggling. so nobody can say amitabh popularized kishor. and many many more that helped in the growth of amitabh’s popularity. i am not glorifying kishor kumar but everybody knows the fact. remove the songs from, sholay,deewar,trishul, it does not make any difference. who can give one song which singed by Mohd Rafi for Amitabh and Rajesh Khanna when they were superstar and the song is not hit?plz plz take me. Look the greatness of Mohd Rafi he loved the Actor(Amitabh)he didn’t sung much more him and he loved the flim he didn’t sung in it…..
Kishore made Amitabh famouse or Amitabh made Kishore? ?plz plz plz KK fans give me one name who said that he is because of KK????? ?IF I am not wrong in Music the KING was Anil Biswas in 1940â€™s in 1950â€™s Naushand Ali,in 1960â€™s was SJ and in 1970â€™s was LP after Mohd Rafi there was no king in music world. Rajesh Roshan said once that u r saying why we donâ€™t give good music as we gave in 1970â€™s because there is no one like Mohd Rafi with us. how can give one song which singed by Mohd Rafi for Amitabh when Amitabh was superstar and the song is not super hit and same to Rajesh Khanna plz? THANKS MR. A.S. MURTY & MOHD RAFI.COM FOR THIS NICE ARTICLE . MUSIC : ” KAMAL RAJASTHANI “. karte ho bhai ? and see how foolish they write. Stupid members and stupid are their posts(many not all). Bas bakte rehte hai.